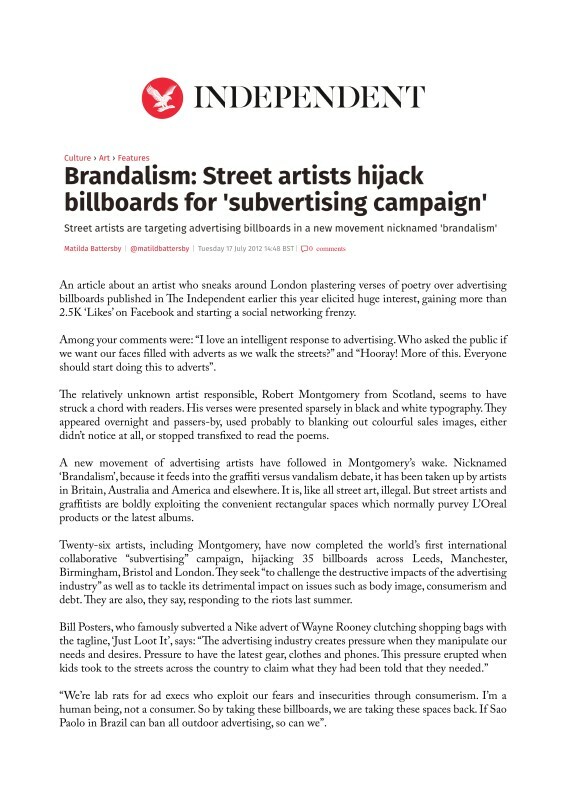 An article about an artist who sneaks around London plastering verses of poetry over advertising billboards published in The Independent earlier this year elicited huge interest, gaining more than 2.5K ‘Likes’ on Facebook and starting a social networking frenzy. Among your comments were: “I love an intelligent response to advertising. Who asked the public if we want our faces filled with adverts as we walk the streets?” and “Hooray! More of this. Everyone should start doing this to adverts”. The relatively unknown artist responsible, Robert Montgomery from Scotland, seems to have struck a chord with readers. His verses were presented sparsely in black and white typography. They appeared overnight and passers-by, used probably to blanking out colourful sales images, either didn’t notice at all, or stopped transfixed to read the poems.